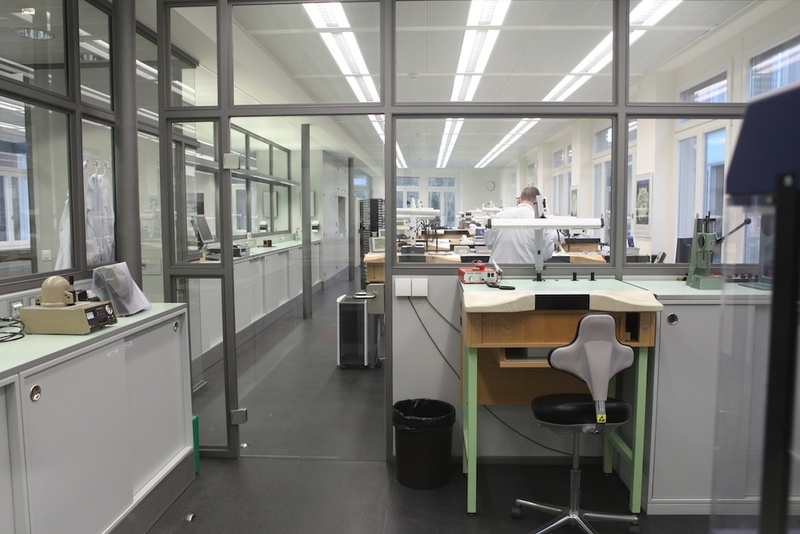 ACL Field Trip | The IWC Watch Factory | A Continuous Lean. 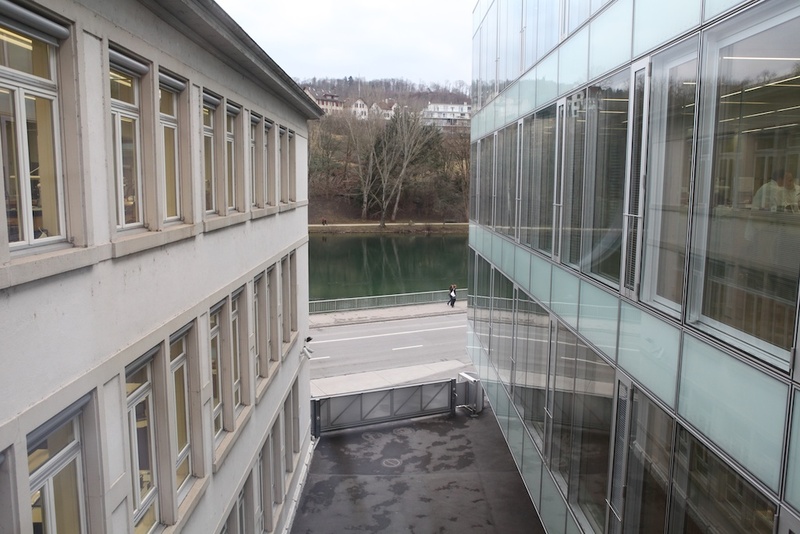 After the SIHH watch fair, we took the train from Geneva to the German speaking side of Switzerland to visit the offices and factory of watchmaker IWC. 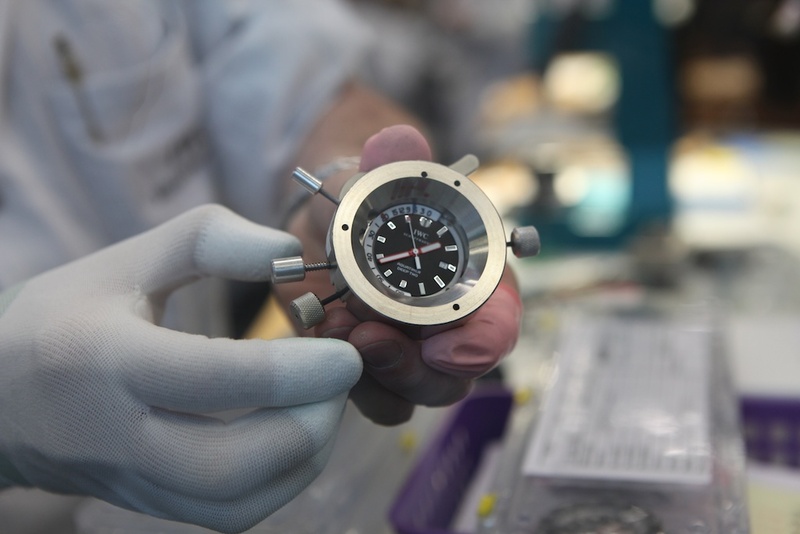 Located about an hour outside of Zurich, the town of Schaffhausen is a small enclave on the Rhine river that has become famous for high end watch manufacturing. 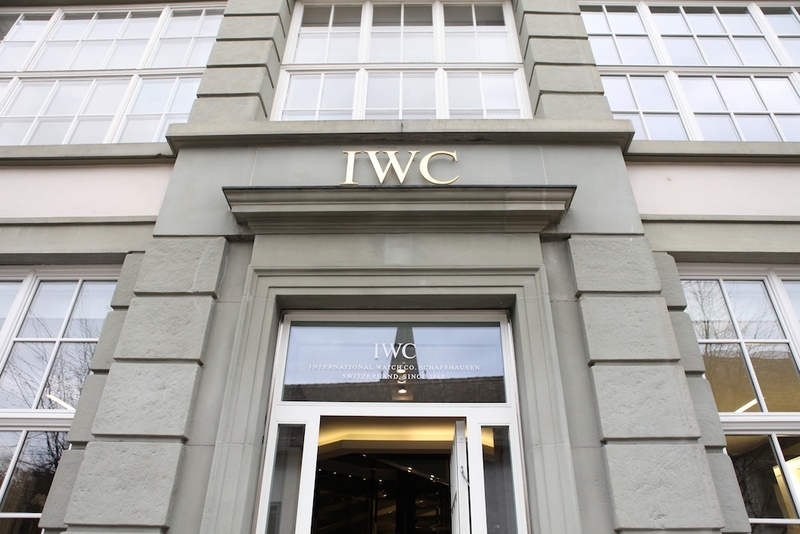 The IWC headquarters look almost exactly as you would expect. 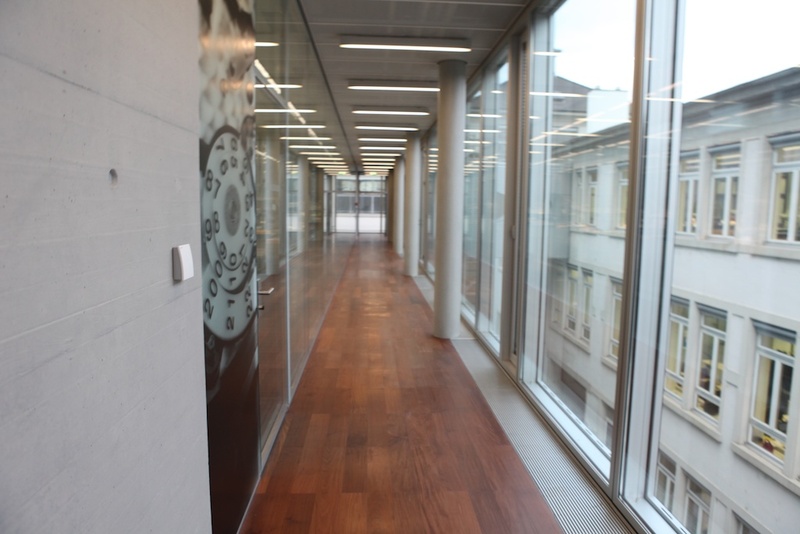 The older part of the building was at one point merged with a perfectly modern, clean and stylish building expansion. The resulting structure is classic and modern all together in one piece. 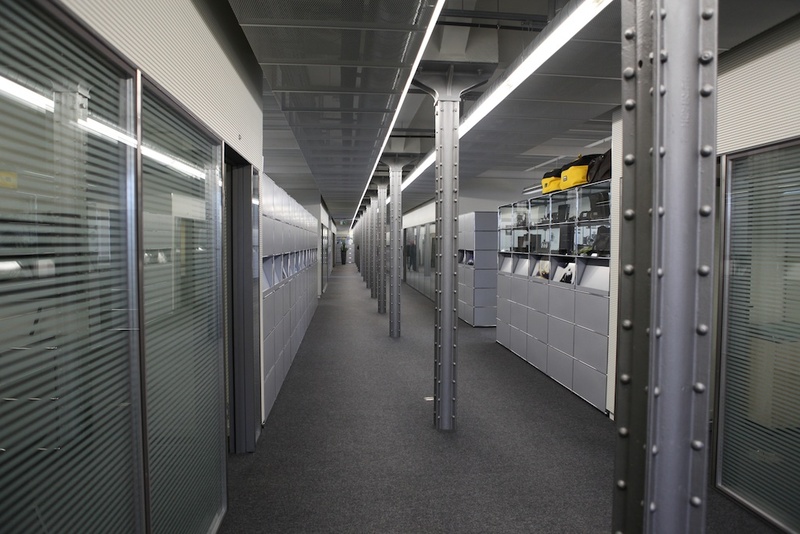 The interiors of the office are outfitted almost exclusively with USM Modular furniture, which made me feel like I was in a Star Destroyer, or at least a Nebulon-B frigate. What I’m trying to say is the place is pretty space aged and cool. 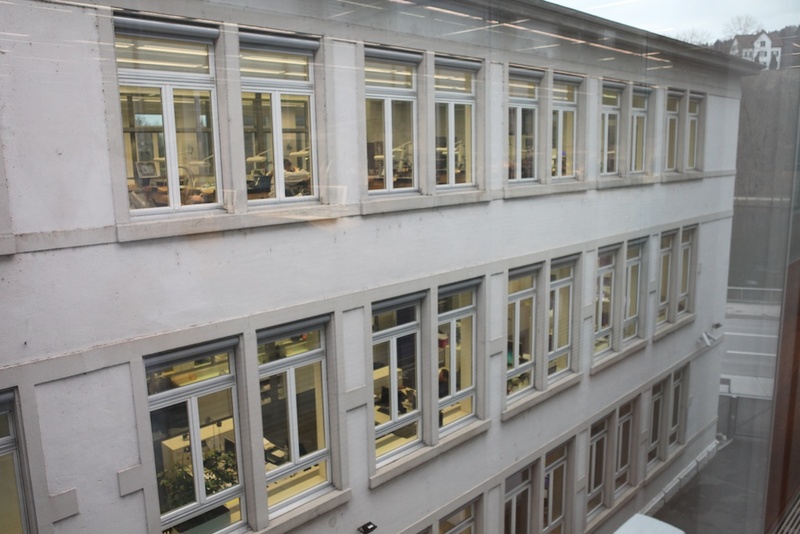 The actual watch makers are located in one of the oldest parts of the main building on the upper floors. 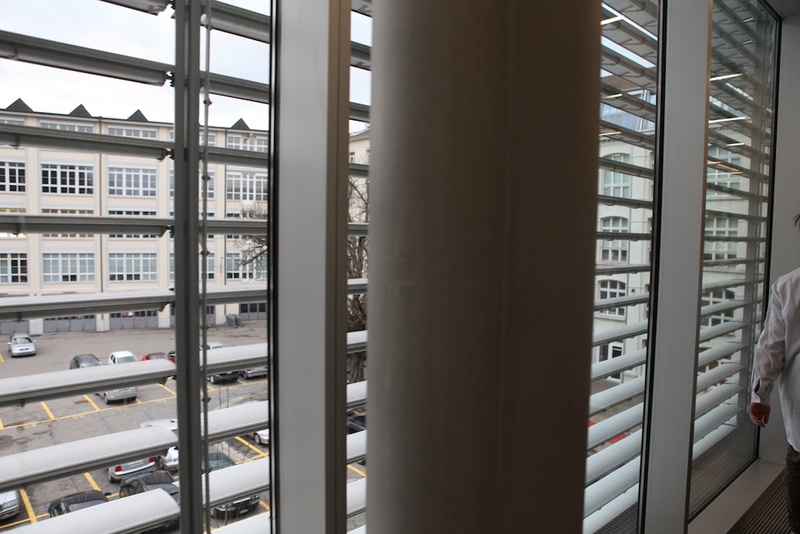 There are windows everywhere and the whole space is flooded with natural light. 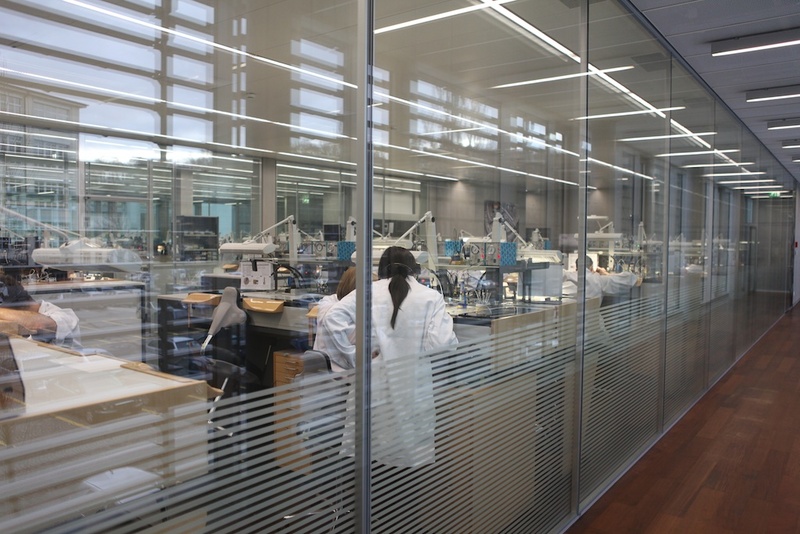 Just to be clear, there is nothing old about anything in this place, except maybe some of the old world manufacturing techniques that are being used to craft the IWC watches. The people working in the factory take measures to keep everything clean and ergonomically correct. 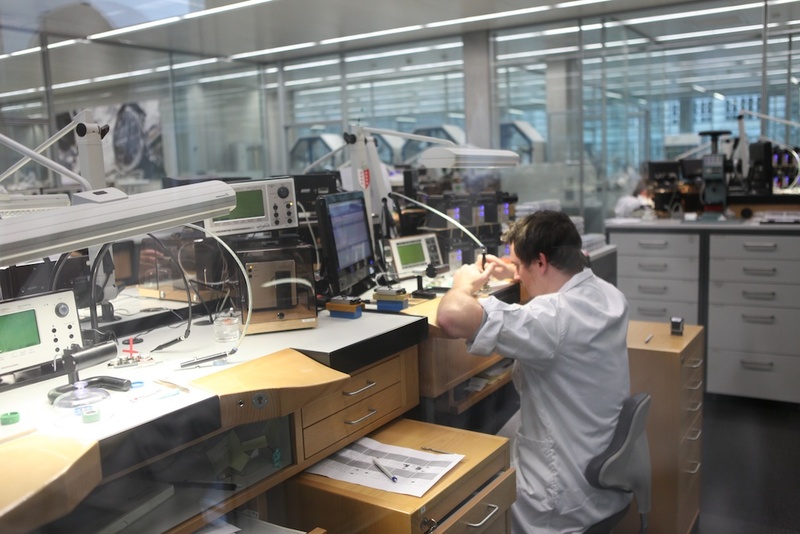 The process of making watches is obviously very challenging physically, and IWC has done everything it can to try and maintain as comfortable a process as possible. To this end, everyone working in the factory wears special slipper like shoes and all work at especially designed desks which help to make assembly easier. 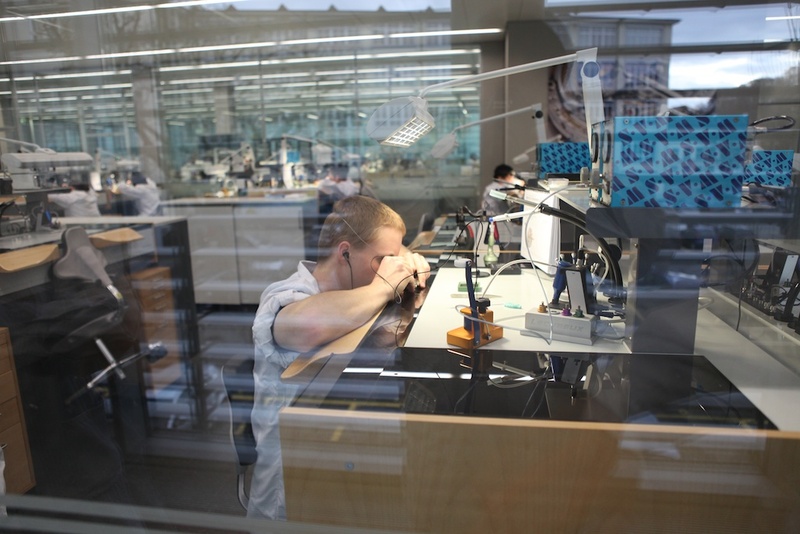 The watchmakers sit low in their chairs with their arms in special padded nooks on the top of their workspace. 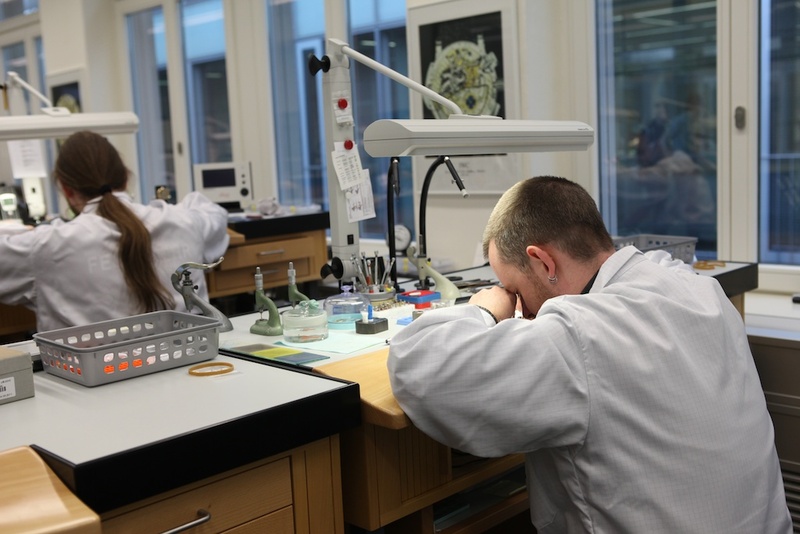 After taking a watchmaking class at the end of our factory tour I can say that the working stance looks crazier than it feels when you are working. 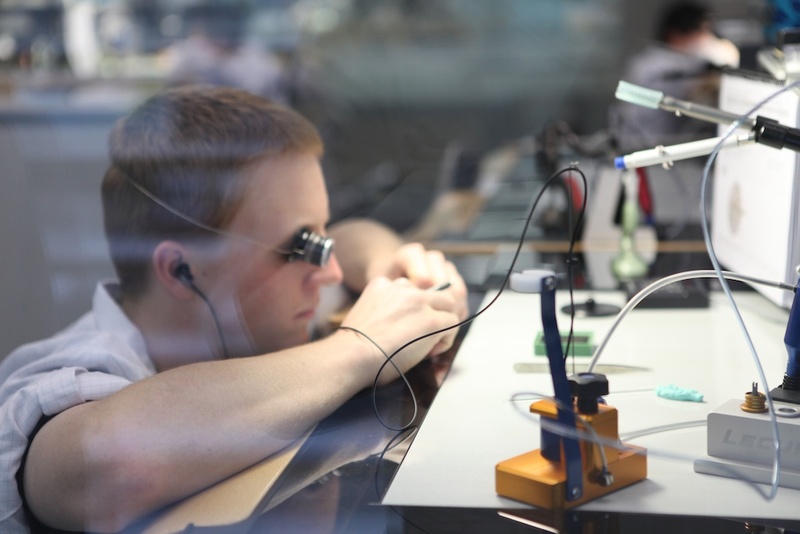 It feels right when you are focusing on manipulating tiny objects with tiny tools. 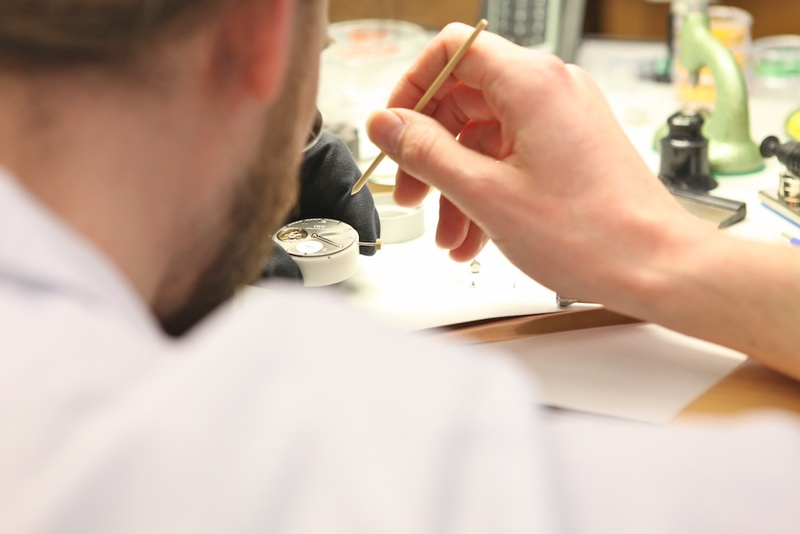 You can see examples of how the watchmakers work in some of the photos below. 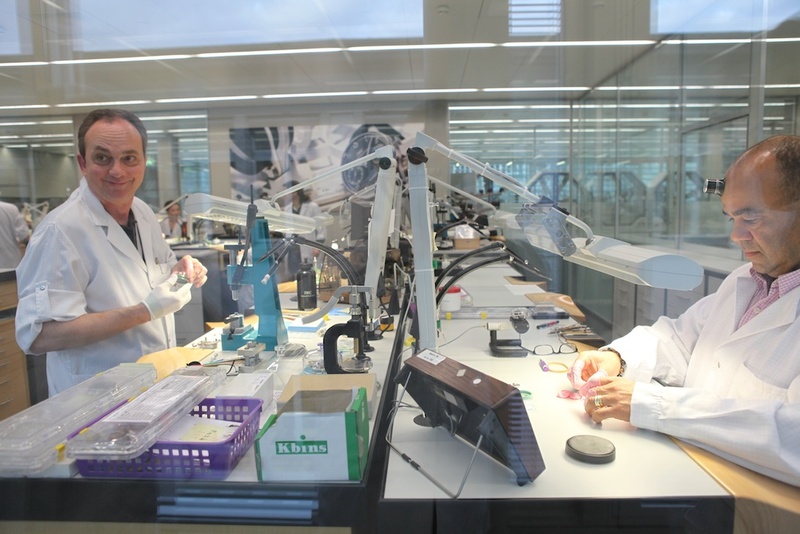 For me to get to see the inner-workings of IWC and how the watches are made is an amazing opportunity. It is also one I am excited to share here. Hope you enjoy. Seeing this place really drove home how much goes into making one of these timepieces. Outstanding. I’ve long been a fan of IWC, particularly of the DaVicini. Thanks for sharing these photos. Okay now I think I understand why these watches are so enormously expensive! 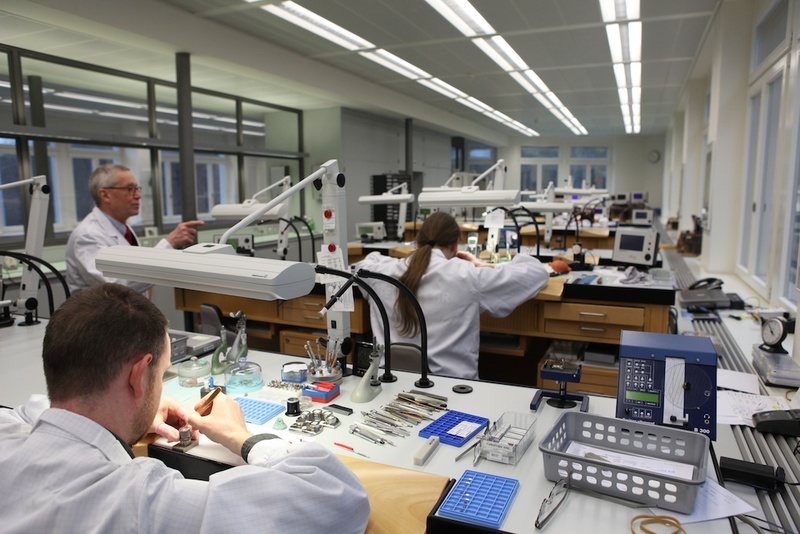 It looks like pretty hard work & the place looks like a laboratory as well. Having said that, the watches appear to have a real “classic” vibe to them which I appreciate very much. The eleventh picture down shows a watch that I’m sure costs as much as my condo. Can anyone provide more information on it? When I purchased my last watch, I knew I wasn’t going to be able to afford anything like this, thus I bought an Omega Seamaster 2531.80 chronometer & I’ve been very, very happy with it. @ Michael, thanks for all the IWC posts. I am a huge fan, the first good watch I bought was a IWC Portuguese Chrono, that was 10 years ago… It’s a very expensive hobby… Now I have 17 IWC’s. I just have a Casio and it seems to do just fine. I’ve had it for 19 years. It cost me about $39. So, I’m looking at less than $2.00 per year ownership cost with no maintenance. 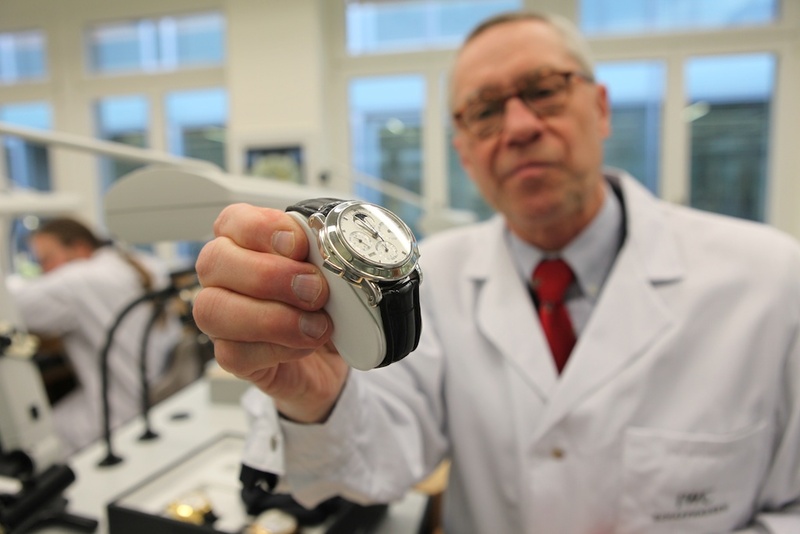 While the IWC looks nice, the ownership cost associated with it would preclude me from purchasing one. Thanks for your interesting story and pictures. Carry on. Thank you for the info. I figured the watch would be priced somewhere on the order of a modest house! Seventeen is pretty staggering-congrats. Unlike cars there’s no auto insurance, tickets, & folks trying to race you every ten minutes in addition to storage problems. Dare I ask, if you were on a desert island, which would be your default IWC? The first time I came across IWC was in Vanilla Sky and I’ve been hooked ever since. Casio is a blasphemous word when talking about such watches. We all know that thriftyness can lead to ownership of things that last. 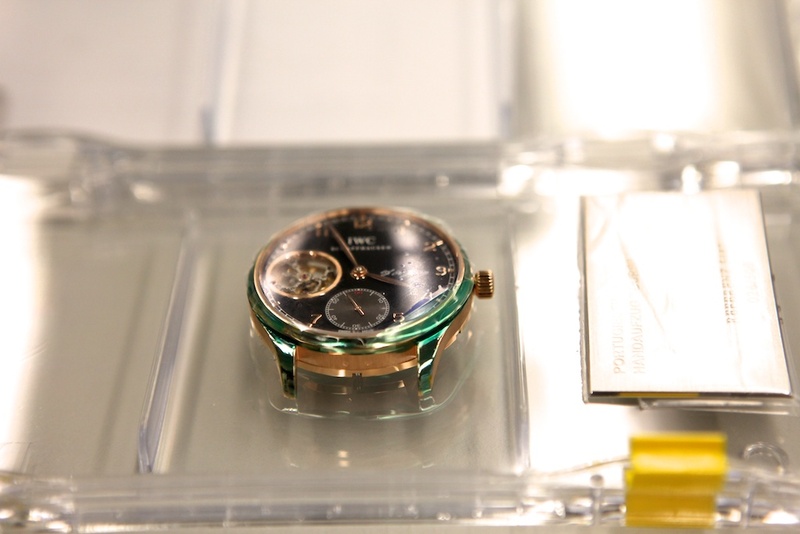 Just enjoy the story about a watch you will never own without bringing price into it. That’s a tough decision. Several of them I bought on personal or professional milestone over the last decade. There is one watch a limited edition Portuguese that took me over 3 years to find. Attached is a link to the watch. It’s the black dial one in stainless with white sub dials. Having so many watches has it’s draw backs. I only keep three at my house and the rest in a safety deposit box. It’s a drag at times having to go and switch them out. I used to work for Wanna Buy a Watch, a vintage watch shop on Melrose in West Hollywood. IWCs were rather rare in the inventory, I suspect because they are super solid and the design really stands the test of time, no pun intended, and the owners just wont part with them. Watches are like luxury cars. Of course a Corolla will run over 200k miles and get you from point A to B, but the mere functionality of a machine is really not the point. Culture is defined by the added value to the functionality. But the difference between watches and cars is that luxury watches actually work very well and stay in tune while luxury cars are in the shop all the time. Generally Swiss and Japanese movements are solid. 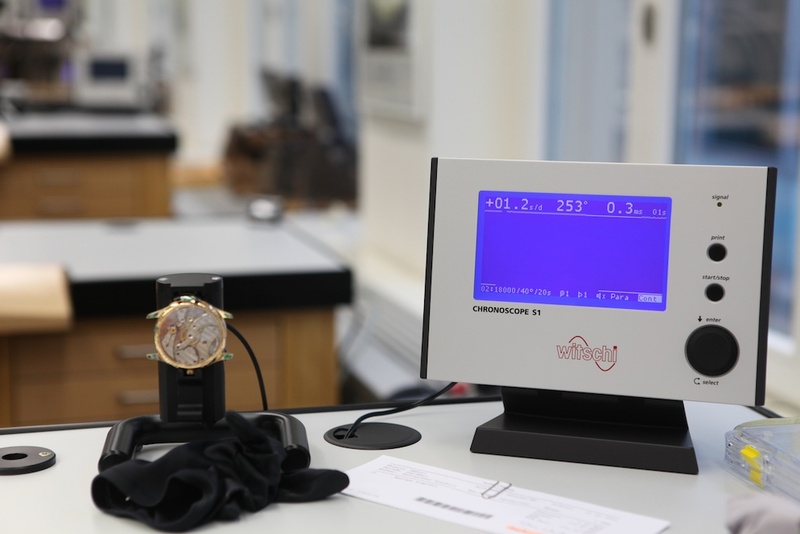 If you cannot afford the prices of brands such as IWC you can still own a worthy wrist watch (mechanical as opposed to quartz movements) for lesser price tag, in brands such as Longines, Zodiac, Seiko and Citizen. I have watches from the 40’s to 70’s that so far needed no maintenance for at least 35 years. 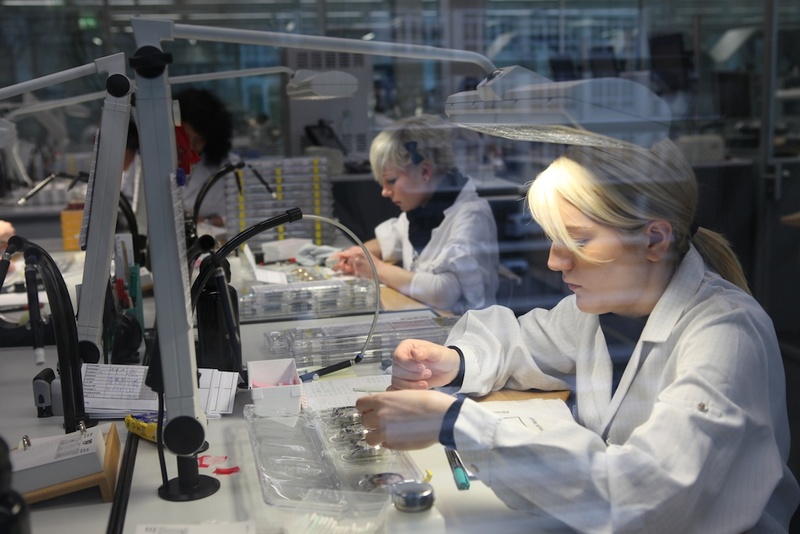 Very interesting post as it’s so rare to get a behind-the-scene look at a luxury timepieces factory. I am the proud owner of a Mark XII and love it. True, IWC’s don’t come cheap (especially when purchased brand new), but the second-hand market is full of opportunites to own modern and vintage IWC pieces (which IMO look even better than the current collection) at a somewhat affordable price (for a mechanical watch made in Switzerland that is). this has to be the coolest post ever. thank you MW. There seems to be an event and place for everything when considering the use of such a timepiece. I would not expect a cobbler to wear a tourbillon equipped model as he performs his mends; it is unnecessary and outright foolish. Of the same expectation, I could not imagine a principal minister to attend an international summit wearing a G-Shock. Either man could own both and enjoy them in the same respects. 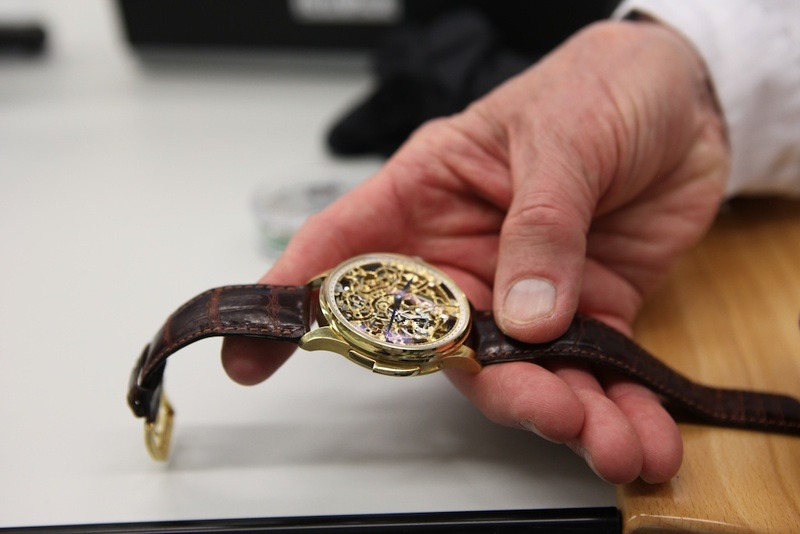 The act of wearing a watch, especially an expensive one, must be deliberate for the event it will accompany you in. However, it must be said that the IWC product line is diverse enough that just about any man with a consistent occupation and proper motivation could obtain an upscale timepiece at an achievable price. That is commendable, as they could very well be an organization of exclusivity, seeking only the most desirable of customers. Thanks for your post and pics. I visited IWC and their museum a couple of years back – like a pilgrimage I guess. I didn’t get into the factory – just the museum. Schaffhausen is a very beautiful little town with a lovely ‘old part’. I am the lucky owner of 1993 ss Jubilee, and several other IWC’s. I think IWC make the most stunning watches. I have just ordered their book Engineering Time and am looking forward to reading it. Ironic, I guess. I’m wearing my IWC Flieger as I type this. It’s one of three IWC’s that I own. I drive a Corolla. 140k miles. So far. that’s kind of cool too. But they better be really good at what they do or really good looking or uber rich. Having a decent watch for business or dress is important. If you ever make it out to Jackson Hole, I will show you my collection. I also have an IWC Mark XII in my collection. It is one of my favorites and probably beats out the others for wrist time. There is something moving about the fine mechanical symphony that hums along effortlessly on the wrist. It’s something the average person and quartz/digital watch wearer just doesn’t appreciate. That’s a good thing or else we’d all be wearing a fine timepiece. Hey Michael seeing as I don’t have 3k sitting around to drop on a watch do you have any suggestions on watches in the $500 price range for the rest of us poor slobs? Hey Eli, (my nick name) I too have the IWC Portuguese 5000, it took me a few years to find mine on ebay at a reasonable price! @Brian O: Check out Tissot. They make some really fantastic, affordable Swiss watches. I apologize for the late post. I’ve never been to Jackson Hole, I imagine the fly-fishing must be pretty nice there. Do you fly fish by any chance? Keeping time. There’s an app for that. I bet that’s a nice rig. Winston makes really sweet rods. What’s your take on cane? Winston made or still makes some nice cane rods I believe. I read somewhere that one of the all time classic rods was made by Winston using IM6 graphite in a 8’6″ length for a 5 weight. Apparently it isn’t made any longer. I’ve been using an old Scott G-series Pow-R-Ply 9ft for 4 weight & really love the rod with an old Orvis cfo III. 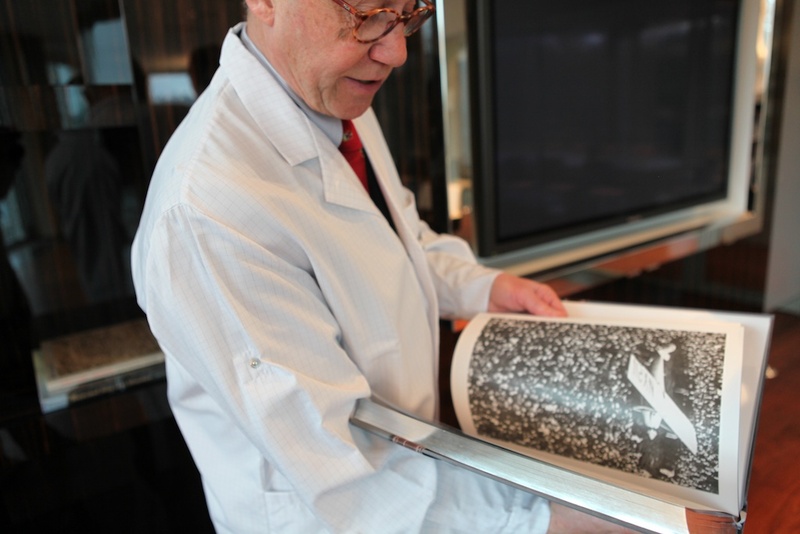 I wonder if the Winston rod that you are referring to is the Tom Morgan Favorite (TMF). It is a four weight rod though. Tom is no longer with Winston, but that rod is a classic. It’s about all that i fish with nowadays.